This CellML model runs in both COR and OpenCell to recreate the published results. The units have been checked and they are consistent. We thank the original model author Anushka Michailova for providing us with the MATLAB code for the 2001 model on which this 2005 model is based. Please note when running a simultaion the step size has to be smaller than 0.005 seconds. ABSTRACT: Changes in cytosolic free Mg(2+) and adenosine nucleotide phosphates affect cardiac excitability and contractility. To investigate how modulation by Mg(2+), ATP, and ADP of K(ATP) and L-type Ca(2+) channels influences excitation-contraction coupling, we incorporated equations for intracellular ATP and MgADP regulation of the K(ATP) current and MgATP regulation of the L-type Ca(2+) current in an ionic-metabolic model of the canine ventricular myocyte. The new model: 1), quantitatively reproduces a dose-response relationship for the effects of changes in ATP on K(ATP) current, 2), simulates effects of ADP in modulating ATP sensitivity of K(ATP) channel, 3), predicts activation of Ca(2+) current during rapid increase in MgATP, and 4), demonstrates that decreased ATP/ADP ratio with normal total Mg(2+) or increased free Mg(2+) with normal ATP and ADP activate K(ATP) current, shorten action potential, and alter ionic currents and intracellular Ca(2+) signals. The model predictions are in agreement with experimental data measured under normal and a variety of pathological conditions. 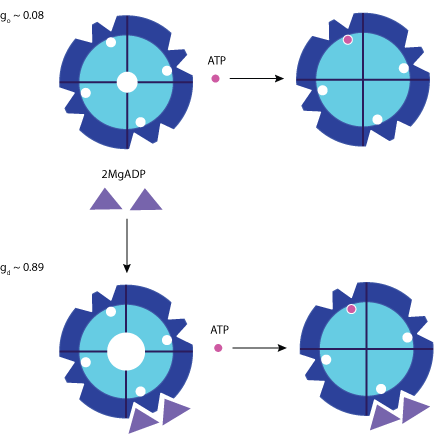 Schematic representation of Kir6.2 and SUR2A subunit stoichiometry in cardiac octameric KATP channel. It is assumed that the single ATP molecule is sufficient to close the channel and that the binding of 2MgADP molecules to one SUR2A subunit increases the channel open probability. 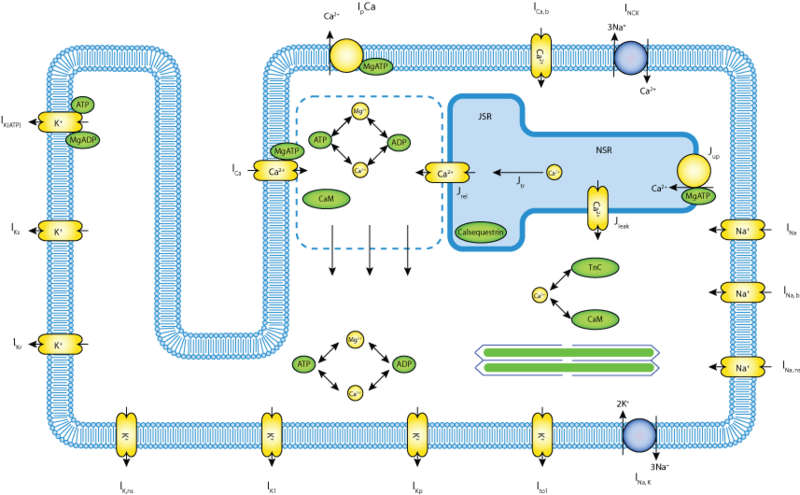 Schematic diagram of the full cell model illustrating Ca2+ and Mg2+ buffering and transport by ATP and ADP, adenine nucleotides regulation of ionic channels and pumps, and electrophysiology in a ventricular myocyte. Derived from workspace Michailova 2005 at changeset f5f59110784d.